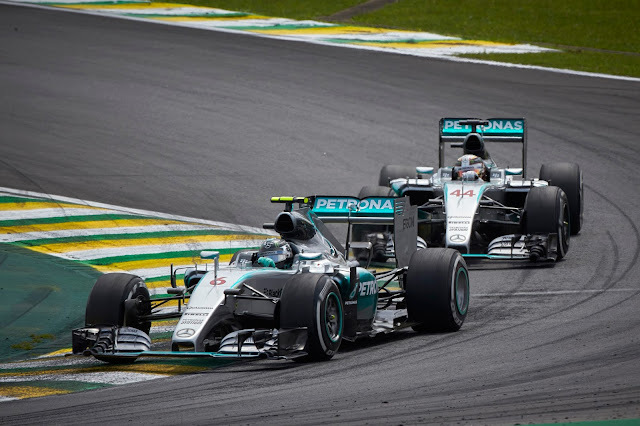 It's fair to say that the Brazilian GP was a rather lacklustre affair, further punctuated by the reigning in of the Mercedes duo by their strategists and pit wall. In his latest BBC column David Coulthard has weighed and measured the reasons behind why Mercedes, and the other teams for that matter, use strategy to further the needs of the team. However, he does go on to suggest that Mercedes should, for the sake of the viewing public, take the shackles off their drivers for the last race in Abu Dhabi. In my opinion the problem with this is it simply a perspective change. Had Lewis been allowed to make his own strategy call and beaten Nico, it wouldn't have made Lewis the gladiatorial figure that everyone is so eager for Formula One drivers to be, it would have simply been a switch of positions during a pit stop. Sure, that may have led to another battle further into the race but Nico may have encountered the same problem as Lewis, not being able to follow another car close enough to affect an overtake. Frustrated by the fact he couldn't get by his adversary, Lewis initially sought to take things into his own hands, with the gap to Rosberg only minimised because Lewis tried to force the team into going off plan, allowing him to pit ahead of Rosberg, afterall if he had no grip left the team would have to pit him... Nico's pace response forced both parties to revert to 'Plan B', a 3 stop strategy, when it was the teams intention to do just two. Now this is one of the issues that Formula One faces, everyone wants to see the drivers flat out every lap and in reality they could be (in terms of tyres). The problem is, it is actually quicker to drive under the maximum potential of the tyres, marginalising the time it would take to complete an additional pit stop. For Brazil this offset is around 23 seconds, so, that is 23 seconds you can be slower over a 2 stop strategy than the driver doing a 3 stopper. One less stop means one less chance of things going wrong during a stop, mistakes are few and far between these days but can still cost a driver valuable time should they happen. Less stops reduces the variable of being stuck in traffic too, something that the Mercedes pair had to contend with in their last stint. As an aside, one of my bug bears in the current format is the blue flag rule, you come out in traffic, you should have to make your way through it. Furthermore, I'm not convinced the race leader should have DRS available to him either, it should be enough that they are on fresh tyres. This was one of the reasons in the last stint that Lewis was left unable to attack Rosberg, with his one lap tyre offset nullified by both Mercedes drivers having DRS. Whilst we are on the DRS discussion, I know many F1 fans still deride it but, it is a means to an end. However, for me, its original implementation was far more successful at improving the racing than it currently is. For those who don't know or have forgotten, DRS zones used to be adjusted in length at each race weekend as an ad-hoc procedure to keep things tight, a bit like a goldilocks ruling, not too short, so passing was impossible and not so long that it was too easy, something in between, making the passing tight. Instead, we now have a situation where the activation zone(s) don't change in length, which takes away an element of strategy. Yes it might mean that the teams have to carry around less rear wing components, as they make decisions based on the prevailing zone length ahead of the event but, for me, it takes away risk too. Furthermore, DRS was initially unlimited during qualifying, which again required a decision in terms of, do I go for better one lap pace at the expense of race pace? Whilst we are here and I've already started on what is wrong with F1, lets take a look at some of the other issues. "The front wings are too complex"
Granted there is an argument that the front wing complexity has gotten out of hand over the last few seasons, however, you then get people saying that the designers are already being strangled. Based on the current technical regulations the front wing designs are actually marginalising many of the inefficiencies born out of the FIA's insistence on reducing downforce. That's right, all of those cascades, canards and flaps help to create vortices that control things further downstream, improving downforce on the whole of the car. Furthermore, you design your car to lead and be the quickest out front and as said car penetrates the air it upwashes it, that's why when in a lead cars wake the front wing is robbed of the premium airflow it requires. Formula One started down a path in 2009 that allowed the flaps to be adjusted by up to 6 degree's twice a lap, balancing the chasing the car as he followed in anothers wake. It was a resounding failure that was mothballed when the Double Decked Diffusers overpowered them. Without DDD's or EBD it may be worth the sport looking at the viability of adjustable front wings once more, it may not provide the answer but certainly looks to put things in the drivers destiny. "These powerunits are not powerful enough"
Whilst the starting weight of the current cars broadly aligns with that of its predecessors, as the fuel burns off the current cars are at a distinct disadvantage. That means that the cars are dragging around an additional 10kg's of fuel at the start of a GP, with 10kg normally good for around 3 tenths in lap time. Get to the end of the race and the cars will be edging toward 60kg's heavier, which should make them around 2 seconds a lap slower than their predecessors"
Ok, so we have established an enemy, how do we defeat it? It's not a simple case of going on a diet, the teams will always run as close to the minimum weights as they can in any case, using what little weight they have left over to use as ballast. That realistically leaves us with two choices, more power or more downforce. The problem with more power is higher fuel consumption, which in-turn means more fuel and more weight. The FIA could adjust the energy matrix to allow for a higher maximum MGU-K deployment, currently 120kw (160bhp) to say 150kw (201bhp) as an example but, I suspect this would get quickly marginalised by the teams. Or perhaps we go back to a push-to-pass system like KERS used to offer, whereby the usual 120kw's is supplied by the MGU-K as part of the throttle map but should the driver have it available to him he can deploy a further 75kw's (100bhp) for 6.33 seconds per lap (500kj's) via a button or paddle on the steering wheel (just like KERS used to be). It would clearly need some alterations to the framing of the regulations but offer the driver an instantaneous strategic tool for defending and overtaking situations. In terms of aero we are comparing apples and oranges because so much was changed, with plenty of downforce lost, and then regained in different ways. The crux of it is though that the cars are now more efficient, less peak downforce, less drag on the straights, which is partly why we see the top speeds increased. See Willem's article I posted a few days ago about accelerating weight and the relationship between it and downforce if you're unsure. My last point on weight (I promise) is refuelling, we were all, myself included, critical of the FIA / strategy groups proposal of reintroducing refuelling into the sport. This was based on a fear that the racing would suffer and overtakes would only be done in the pit stops, enforced by the statistics captured in the image below. However, it may be a necessary evil, a way of reducing the weight of the cars at the start of the race, marginalising the weight issue. Yes the cars would still be 702kg's dry but it leads to a revision of the strategy options, mixing up the racing and allowing some of the teams to get track position they'd not ordinarily have. Furthermore, as we can see, the sharp increase in overtaking coincides with two things, Pirelli's entrance to the sport and the F-Duct in 2010, followed by DRS from 2011. Matthew I remember very clearly and am still astonished when RBR was using drs mid corner or alot earlier than any other team, such was the downforce and stability of that car back then. Sir Newey et al superb job . Also F1 prides itself on its aeronautical background and likes to be at the cutting edge, why can't we have refueling during the race like when a fighter jet refuels. Maybe a Zepplin hovering around? Now wouldn't that be a spectacle to bring more people to race weekends. Only partly tongue-in-cheek, I'd ban static aerodynamic parts under the same regime as movable ones - can only be a secondary effect. Personally - I think I'd like to see a rethink of the regs preventing aero advantage from the exhaust gasses. In a world of trying to harvest every drop of performance from the fuel burn, why can't we let teams grab what's left at the back pipe and use it to extract down force? Could the MGU-H be used to control the off-throttle energised air rather than the ALS-like fuel burn we had with the V8s which so rankled the FIA? Another though Matt, without knowing much about the feasibility - could the aero wakes be controlled by regulation to be thrown up and over a closely following car, creating a calmer bubble of air in which a car could follow closely?